One year after missing the MEAC Tournament giving birth to her son, Bethune-Cookman’s Vanessa Blair-Lewis is making history. Only a handful of people stuck around the Scope Arena as Bethune-Cookman celebrated winning its first women’s MEAC Tournament title in 25 years. That was to be expected, after all, as BCU’s 57-45 win killed home favorite Norfolk State’s chance of claiming on the title. It was a celebration well worth sticking around for as coach Vanessa Blair-Lewis and her team laughed, cried, let everybody and their mama cut down the nets (literally) and even formed a prayer circle at mid-court after the game to send praises above. The win was a long time coming for Blair-Lewis as her team watched three-straight regular season titles result in zero MEAC Tournament titles from 2016 through 2018. The win was a long time coming for the coach and the program. When she took over a decade ago, BCU was dead last in the MEAC in pretty much everything that mattered. But the young coach had a goal of getting the program to the NCAA’s, something it had never done. “I knew what I was taking, when I took this job. And I believe that our athletic director (Dr. Lynn Thompson) just wanted the girls to have a great experience. But I don’t think he knew who he hired,” Blair-Lewis said. “I knew that before I left here, before I left here, whether I was in the grave or I retired, I was gonna do what some people thought could not be done with some of the most incredible women that nobody else wanted. Tears began to fall as she rattled off the names of some of the young ladies who helped her build the program into a perennial power in the MEAC. Angela Golden, the 2019 Most Outstanding Player, was one of the players on that 2017 team that lost in the finals to Hampton. She didn’t play in the game, though, so she was especially thrilled to be a part of history. It was a championship run that few saw coming early in the season when the Wildcats were hit by a wave of injuries. Five players dealt with near surgeries, including three ACLs and two meniscus tears. Undaunted, the team believed in itself and finally broke through on Saturday. BCU learned on Monday it would take on defending champion Notre Dame in the first round of the NCAA Tournament. Blair-Lewis didn’t know who exactly her team would play as she spoke at the podium in Norfolk on Saturday, but she was clear that she knows history is on her team’s side. At least off the court. Saturday’s win was also a full-circle moment for Blair-Lewis as a coach, a woman and a mother. As she waited while her team cut down the nets, she held a bouncing baby boy in her arms and talked with supporters and family. 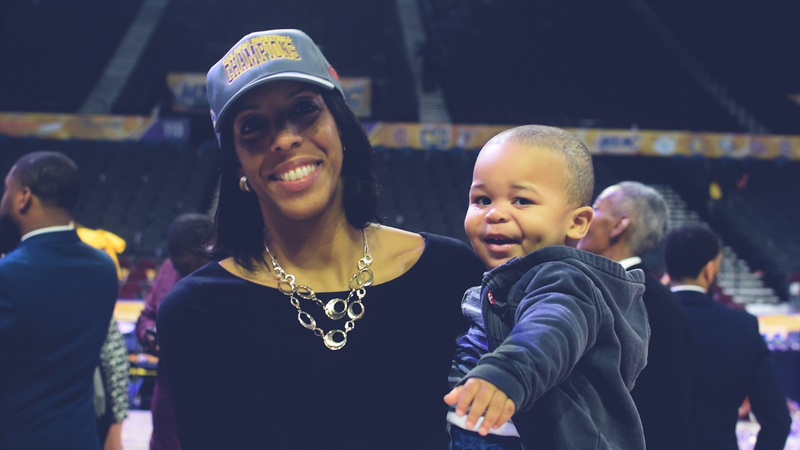 Just one year earlier she had given birth to young Bryce Robert, who was born during the MEAC Tournament in 2018. His birth forced her to miss the tournament, as her team saw its season end with a 61-60 loss to Hampton in the semifinals that year.